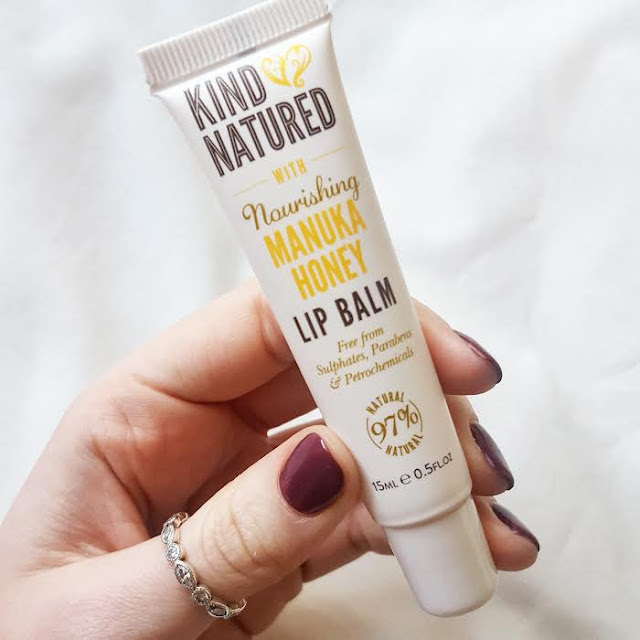 Today I am talking about a lip product that I so desperately wanted to love which is the Kind Natured Nourishing Manuka Honey Lip Balm that I picked up in my local Boots. There were two main reasons why I wanted to love this Kind Natured lip balm, first being it's honey...I mean what can I say, I am drawn to bees and bee products so if it's got honey in but best believe that thing is added to my basket quicker than you can blink. But I also loved the fact 97% of the ingredients are natural. I'm trying to be more aware of what is going in and on my body so if I can find something that is more natural or has less additives or chemicals I wanna try it out. Another thing to be aware of is a lot of lip balms contain salicylic acid which is an ingredient used in acne treatments to dry out the spots...why would you want to use a lip balm that has ingredients to dry your lips out? Kind Natured doesn't contain this ingredient so I was super excited to try it out. I only wear lip balm at night because there is less chance of me licking my lips and having to keep reapplying it, this really gives me a chance to see if a lip balm can make a difference over night. The first thing I noticed was the INCREDIBLE smell, if you like honey this is just like rubbing a spoonful over your lips only way less sticky but quite runny. You can see it's in a tube and I was expecting it would be thicker but when I squeezed it I had a bit of a disaster because it just went everywhere. Anyway, I put it on and went to the land of nod with very high hopes. When I woke, I was actually really disappointed as it literally didn't do anything to my dry lips. They didn't feel softer, they didn't feel nourished it was like I went to bed with a lipgloss. One thing to note is that my lips were quite chapped, like this little balm would have really had to go some to make them perfect but I was expecting at least a little improvement. I think that this product is probably better used under matte liquid lipsticks as a primer but not really that great for actually repairing chapped/dry lips. So it's back to my beloved Burts Bees Lip Balm. What products have you been left a little disappointed with? Oh I do love a good honey balm, but it's a shame you didn't get on with it! I really want to try Burt's Bees as my lips need some TLC, asap! Yes I second this, the Burt's Bees original lip balm is amazing! Perhaps it is best used to maintain good lips? Or maybe try it again, but for perhaps a week and see if there has been any difference then. I was going to say my favourite is Burts Bees but you're already right on that one! I love it and have a couple dotted around my flat as i'm always reaching for it, it's the best!